Force en error state in this object, as if an error was reported. Debug level is accessible to subclasses. 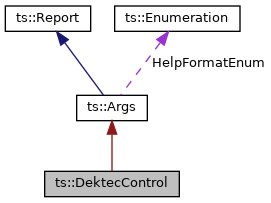 A class implementing the tsdektec control utility. This is defined as a separate class the interface of which does not depend on DTAPI. The binary DTAPI is privately isolated inside tsduck.dll/.so. Args object flags, used in an or'ed mask. Don't terminate application on error. Don't terminate application on --help. Don't terminate application on --version. Specifies that all options must be placed before the parameters. Once the first parameter is found, all subsequent elements on the command line are considered as parameters, even if they start with '-' or '--'. Display help using info() on this object, not standard error. No default option from the configuration file. Type of an argument or parameter. Integer argument, must set min & max values. Integer 0..0x1FFF (an MPEG PID value). Tristate value, ts::MAYBE if absent. Types of help formatting, for getHelpText() and predefined option --help. [in] argc Command line argument count. [in] argv Command line arguments. Add the definition of an option. This method is typically invoked in the constructor of a subclass. [in] name Long name of option. 0 or "" means a parameter, not an option. [in] short_name Optional one letter short name. [in] type Option or parameter value type. [in] min_occur Minimum number of occurences of this option on the command line. [in] max_occur Maximum number of occurences. 0 means default : 1 for an option, unlimited for a parameters. [in] min_value Minimum value, ignored if type is not INTEGER. [in] max_value Maximum value, ignored if type is not INTEGER. [in] optional When true, the option's value is optional. A reference to this instance. Add the definition of an option, the value being from an enumeration type. [in] enumeration List of enumeration values. The command line parameter value can be a string describing an enumeration value or directly an integer value. In the application, the option's value is always the integer value of the enumeration value. Add the help text of an exiting option. [in] syntax String to display for the option value instead of the default "value". For instance: "address:port" "'string'". [in] text Help text. Unformatted, line breaks will be added automatically. const UString & separator = u", "
When an option has an Enumeration type, get a list of all valid names. [in] separator The separator to be used between values, a comma by default. A comma-separated list of all possible names. Copy all option definitions from another Args object into this one. This method is typically invoked in the constructor of a subclass to import all option definitions of another instance. [in] other Another instance from which to get the options. [in] replace If true, override duplicated options which were already declared in this object. If false (the default), duplicated options are ignored. A reference to this object. Set the description of the command. [in] description A short one-line description, e.g. "Wonderful File Copier". Set the syntax of the command. [in] syntax A short one-line syntax summary, e.g. "[options] filename ...". Set the introduction or preamble text for help description. Set the option flags of the command. [in] flags Define various options, a combination of or'ed values from Flags. Get the description of the command. A short one-line description of the command. Get the syntax of the command. A short one-line syntax summary of the command. Get the option flags of the command. A combination of or'ed values from Flags. Get a formatted help text. [in] format Requested format of the help text. [in] line_width Maximum width of text lines. The shell string is an optional prefix for the syntax line as displayed by the --help predefined option. The shell name is displayed before the application name. [in] shell Shell name string. Load command arguments and analyze them. Normally, in case of error or if --help or --version is specified, the application is automatically terminated. If some flags prevent the termination of the application, return true if the command is correct, false if the command is incorrect or --help or --version is specified. [in] argc Number of arguments from command line. [in] argv Arguments from command line. The application name is in argv. The subsequent elements contain the arguments. [in] processRedirections If true (the default), process command line arguments redirection. All lines with the form '@filename' are replaced by the content of filename. By default, always return true or the application is automatically terminated in case of error. If some flags prevent the termination of the application, return true if the command is correct, false if the command is incorrect or --help or --version is specified. [in] arguments Arguments from command line. Check if options were correct during the last command line analysis. True if the last analyze() completed successfully. Get the application name from the last command line analysis. The application name from the last command line analysis. Check if an option is present in the last analyzed command line. [in] name The full name of the option. If the parameter is a null pointer or an empty string, this specifies a parameter, not an option. If the specified option was not declared in the syntax of the command, a fatal error is reported. True if the corresponding option or parameter is present on the command line, false otherwise. Check the number of occurences of an option in the last analyzed command line. The number of occurences of the corresponding option or parameter in the command line. Get the value of an option in the last analyzed command line. [out] value A string receiving the value of the option or parameter. [in] def_value The string to return in value if the option or parameter is not present in the command line or with fewer occurences than index. [in] index The occurence of the option to return. Zero designates the first occurence. [in] def_value The string to return if the option or parameter is not present in the command line or with fewer occurences than index. The value of the option or parameter. Get all occurences of an option in a container of strings. [out] values A container of strings receiving all values of the option or parameter. Get the value of an integer option in the last analyzed command line. If the option has been declared with an integer type in the syntax of the command, the validity of the supplied option value has been checked by the analyze() method. If analyze() did not fail, the option value is guaranteed to be in the declared range. INT An integer type for the result. [out] value A variable receiving the integer value of the option or parameter. [in] name The full name of the option. If the parameter is a null pointer or an empty string, this specifies a parameter, not an option. If the specified option was not declared in the syntax of the command or declared as a non-string type, a fatal error is reported. [in] def_value The value to return in value if the option or parameter is not present in the command line or with fewer occurences than index. [in] def_value The value to return if the option or parameter is not present in the command line or with fewer occurences than index. The integer value of the option or parameter. Get all occurences of an integer option in a vector of integers. [out] values A container of integers receiving all values of the option or parameter. Get all occurences of an integer option in a set of integers. Get all occurences of an option as a bitmask of values. [out] values A bitset receiving all values of the option or parameter. For each value of the option, the corresponding bit is set. Values which are out of range are ignored. [in] defValue The boolean to set in all values if the option or parameter is not present in the command line. Get an OR'ed of all values of an integer option in the last analyzed command line. This method is typically useful when the values of an option are taken from an Enumeration and each value is a bit mask. When specifying several values, the result of this method is a mask of all specified options. [in] def_value The value to return in value if the option or parameter is not present in the command line. The OR'ed values of the integer option. [out] value A variable receiving the OR'ed values of the integer option. Get the value of an enum option in the last analyzed command line. Typically used when the option was declared using an Enumeration object. ENUM An enumeration type for the result. [out] value A variable receiving the enum value of the option or parameter. The enum value of the option or parameter. Get the value of tristate option in the last analyzed command line. [out] value A variable receiving the tristate value of the option or parameter. The returned value is always one of the three valid Tristate values. When the option or parameter is not present in the command line or with fewer occurences than index, the returned value is MAYBE. For options with optional values, if the the option is present without value, the returned value is TRUE. The tristate value of the option or parameter. The returned value is always one of the three valid Tristate values. When the option or parameter is not present in the command line or with fewer occurences than index, the returned value is MAYBE. For options with optional values, if the the option is present without value, the returned value is TRUE. Exit application when errors were reported in the last analyzed command line. [in] force If true, ignore flag NO_EXIT_ON_ERROR and force application termination on error. [in] report Where to report errors. The redirection is cancelled if zero. [in] level Set report at least to that level. Process argument redirection using '@' on a vector of strings. [in,out] args A vector of strings. All lines of the form '@filename' are replaced by the content of the given file. A double '@@' at the beginning of a line is replaced by a single '@' without reading a file. True on success, false on error (non existent file for instance). Errors are reported though this object. Must be implemented in actual classes. The method is called only when a message passed the severity filter. It is not necessary to recheck severity inside the method. Messages with higher severities are not reported. [in] level Set report to that level. Check if debugging is active. True if current reporting level is Debug or higher. Report a debug message with a printf-like interface. [in] fmt Format string with embedded '%' sequences. [in] args List of arguments to substitute in the format string. Check if verbose reporting is active. True if current reporting level is Verbose or higher. Report a verbose message with a printf-like interface. Report a message with an explicit severity. This method is the central reporting point. If filters the severity and drops the message if severity is higher than maxSeverity(). Subclasses should override writeLog() to implement a specific reporting device. It is not necessary to override log() unless the subclass needs to implement a different severity filtering policy. Report a message with an explicit severity and a printf-like interface. Report a fatal error message. Report a fatal error message with a printf-like interface. Report a severe error message. Report a severe error message with a printf-like interface. Report an error message with a printf-like interface. Report a warning message with a printf-like interface. Report an informational message with a printf-like interface. To be used as value for parameter max_occur to indicate that there is no limit to the number of occurences of an option. Warning: use only for max_occur (size_t ). Do not use for max_value (int64_t ) since size_t is uint64_t on 64-bit platforms. To be used as value for parameter @ max_value to indicate that there is no limit to the parameter integer value. Typically used to implement the --help command line option.